If the annual joke is that the Oklahoma Legislature uses the governor’s proposed executive budget as a doorstop, members of Gov. Kevin Stitt’s cabinet hope his “consensus-building approach” will help move his proposed fiscal prudence forward. Stitt delivered his strategy and vision for Oklahoma during his first State of the State address today, proposing a raise in teacher pay and an extra emphasis on saving for rainy days. But his proposal included no increase for classroom dollars, something many teachers have emphasized. Stitt outlined his proposal for the state to address “more than $230 million in obligations and another $151 million in critical needs.” The obligations include debt payments, property tax reimbursements for manufacturing exemptions and other items. Among Stitt’s $151 million in “critical needs” are dollars for the additional teacher pay hike ($70.6 million), proposed audits for the state’s 12 highest-funded agencies and replacement of federal matching funds for the Children’s Health Insurance Program. In all, Stitt’s proposed FY 2020 appropriations to 65 state agencies would come in $182.8 million above the previous year, leaving between $250 million and $380 million untouched as additional savings held in the State Treasurer’s Office, depending upon the Board of Equalization’s final estimates at its Feb. 20 meeting. We believe financial sustainability to be an important objective. To adequately prepare for the next downturn, we recommend a cash savings target of at least $1.1 billion, which still does not even match two months of general appropriations. Mazzei said the governor is supportive of filed legislation that would increase the Rainy Day Fund’s cap to 30 percent of the state budget. Such a change would require a vote of the people, however. At 590 pages, Stitt’s FY 2020 proposed executive budget is linked here as a hefty PDF fitting of the proverbial door stop. But Mazzei said he believes it presents an excellent resource for lawmakers and the public whether the Legislature follows the recommendations or not. $150,000 for the Pardon and Parole Board “to hire two additional field staff to expedite critical work activities related to the investigation and processing of pardons and paroles,” according to Stitt’s budget. “The governor does not want Oklahoma to be number-one in the nation for incarceration, so criminal justice reform is an important part of his strategy,” Mazzei said. Friday morning, leaders of the Oklahomans for Criminal Justice Reform Group held a press conference to release its 2019 legislative agenda, which included a call for retroactive implementation of State Question 780’s reclassification of drug possession and theft crimes. On Jan. 30, Stitt attended a forum hosted by the Associated Press and said he was “open” to SQ 780 retroactivity. He also said he wanted to see reform of how Oklahoma’s prosecutors are funded. But a review of the text of Stitt’s State of the State speech showed no reference to the issue Monday, leaving it perhaps for negotiation with legislators as the 2019 session moves forward. In Stitt’s numbers released Monday, district attorneys and the District Attorneys Council would receive the same appropriation afforded them last year: $36.1 million. House Minority Leader Emily Virgin (D-Norman) held a press conference shortly before 2 p.m. Monday and praised Stitt’s comments about criminal justice reform but questioned his statements that were skeptical of any potential Medicaid expansion. 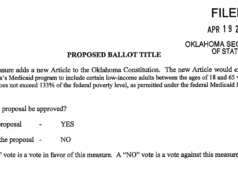 In his speech, Stitt appeared to walk back his comments at the Jan. 30 AP forum indicating he would be open to finding federal approval for a version of Medicaid expansion. Sen. Kay Floyd (D-OKC) also spoke to media Monday afternoon and said her caucus remains hopeful for a Medicaid expansion deal this session. “Health care should not be a partisan issue,” Floyd said.